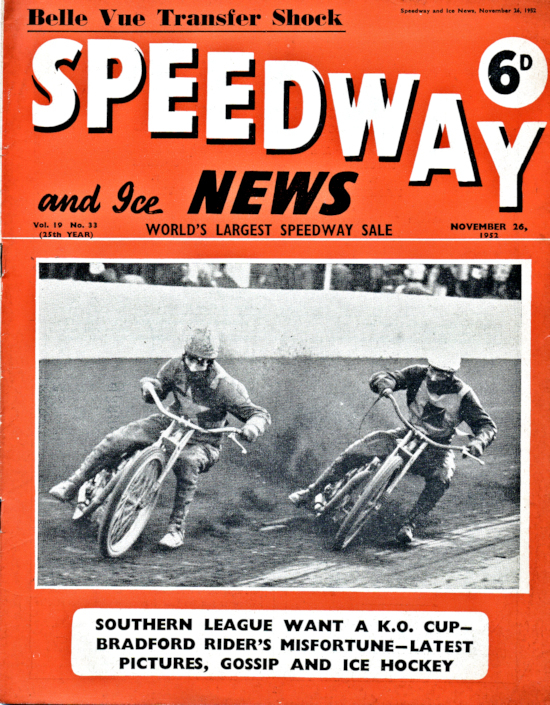 Since becoming interested in speedway from 1961. I have developed an interest in the modes of transport employed in getting a rider and his bike(s)/equipment around the tracks. In the modern era all riders appear to have at least two bikes, a large van and a load of equipment with them at every meeting. This wasn’t the case years ago. 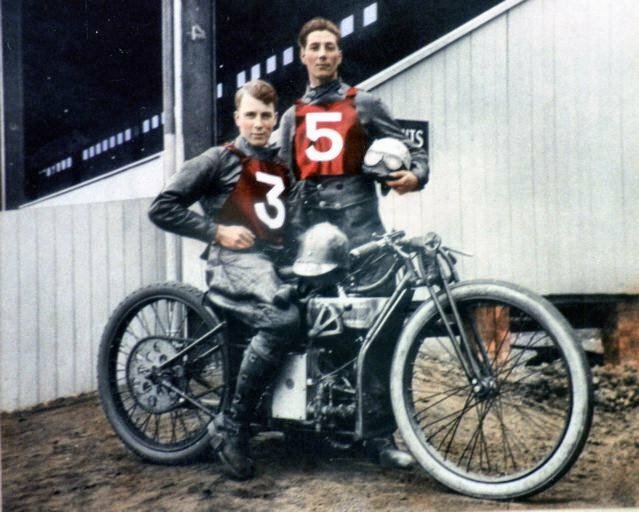 The early pioneers in 1928-1929 would set off for a race meeting on their street legal bikes to the track and then in the pits proceeded to strip the bike down, removing mudguards, lights etc and were also instructed by early dirt track racing rules to disable the brakes. Then the riders took to the track on their stripped down machines. At the end of the racing the rider would refit all the parts removed, reconnect the brakes and ride the bike home. Modern riders have it so much easier with mechanics and a large van. Most tracks used to have a "Track Spare" which could be used in an emergency if the rider wrecked their bike or had serious running problems. 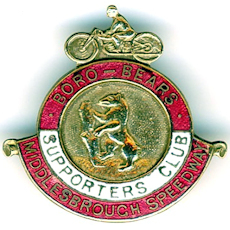 The track spare usually started off the season in good running order but was often plundered by a rider in difficulties taking parts off it to keep his own bike going leaving the spare in a state of disrepair. As a result the "Track Spare" idea was done away with over the years. 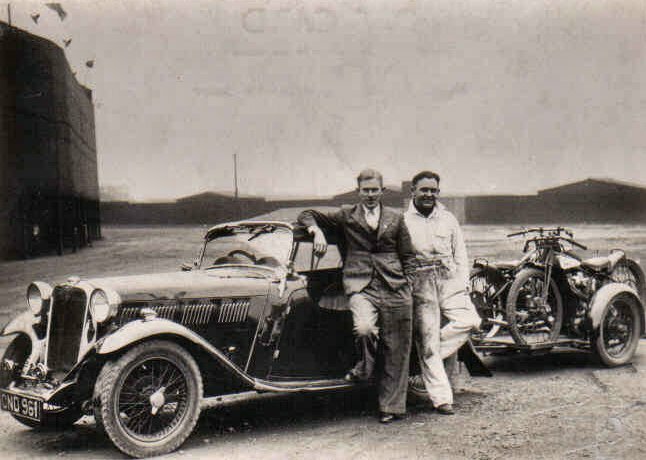 This is Canadian Eric Chitty and his mechanic at West Ham in the 1930's. 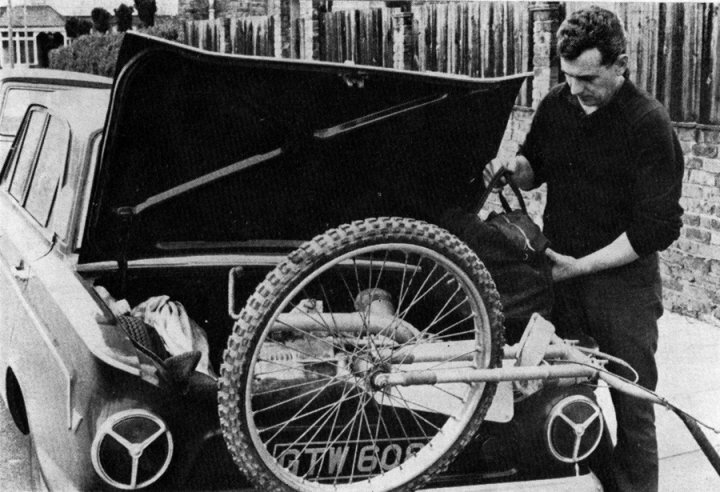 He was a very successful rider hence he could afford the sports car, trailer and two bikes. 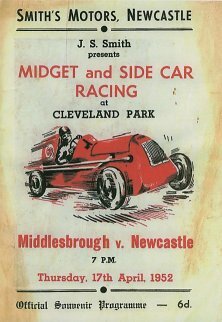 This photo was taken in Wallsend close to Newcastle's race track Brough Park. It was taken in 1948 and shows novice rider John Hunter and friends on their way to Brough Park. 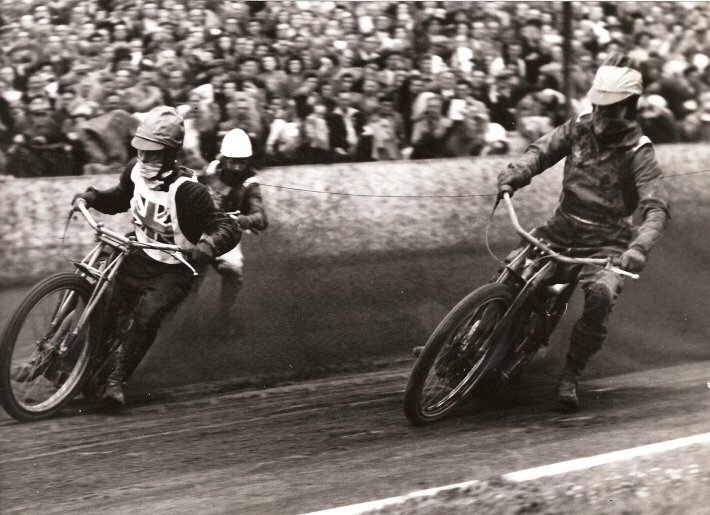 The guy on the left was another rider Stuart Robson, no relation to the 2013 Newcastle rider by same name. The combination was a 1923 Harley Davidson. I don't know what the other road bike was. 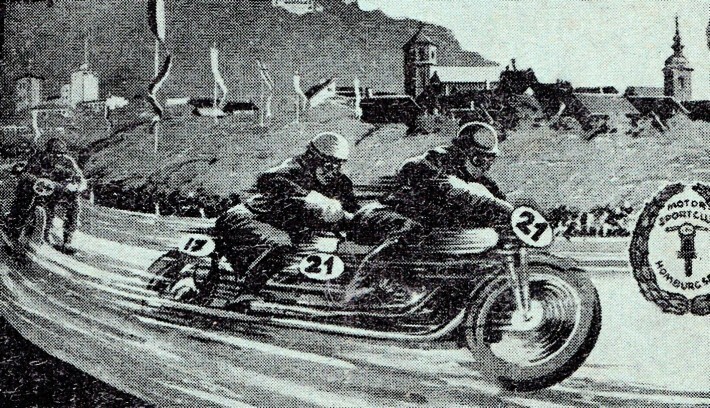 The speedway machine in the sidecar was I am told a Rudge with a JAP engine. 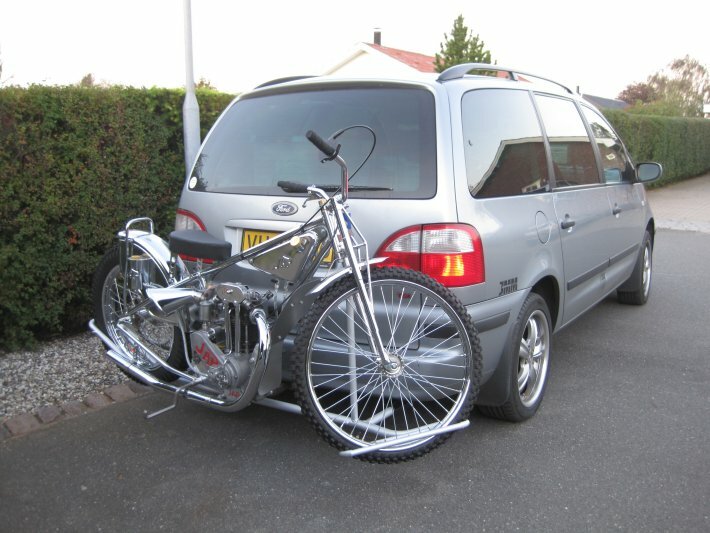 The other speedway bike has it's chain removed so the back wheel could revolve freely on the road. 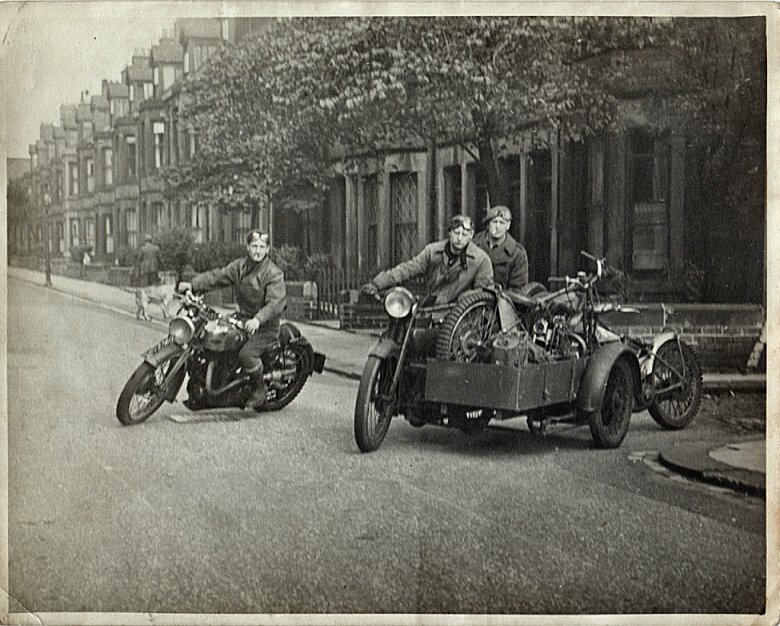 It was common to see speedway bikes transported in this fashion before car/van ownership did away with the motorcycle combination. 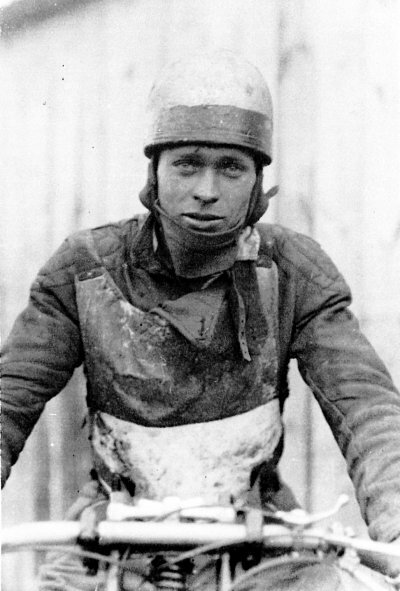 A notable "Name" Reg Fearman, started his riding career this way. 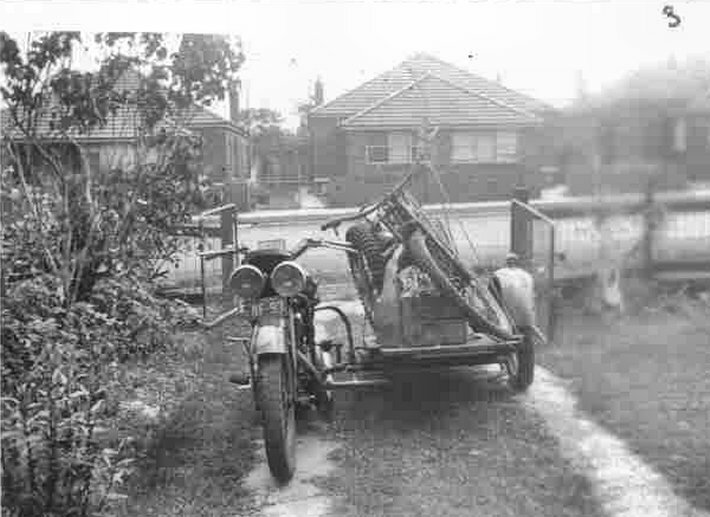 My friend Reg Fearman used the above pictured sidecar combination when he was riding in Australia in 1950/51 The workhorse machine was a Panther 650cc, a far cry from Reg's Rolls Royce's which he owned when he was promoting in the 1960/70s in the UK. 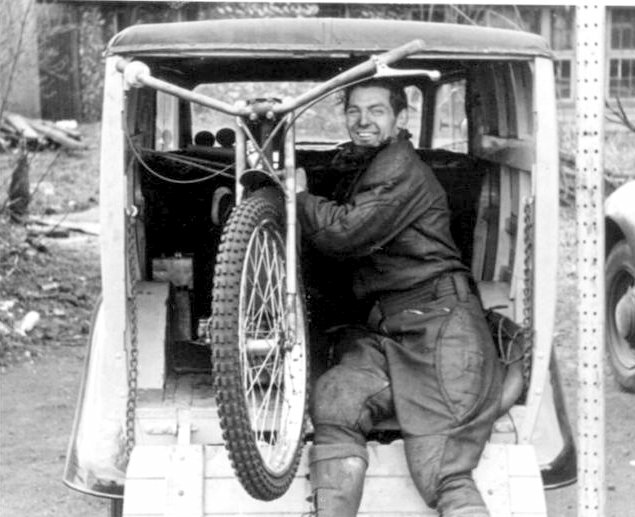 Reg Trott with his van at Rye House in 1950's, looking very happy as he loads his bike into a strange looking vehicle, it appears to have a rear door that becomes a ramp when let down and partly wooden in construction, unless I am wrong. 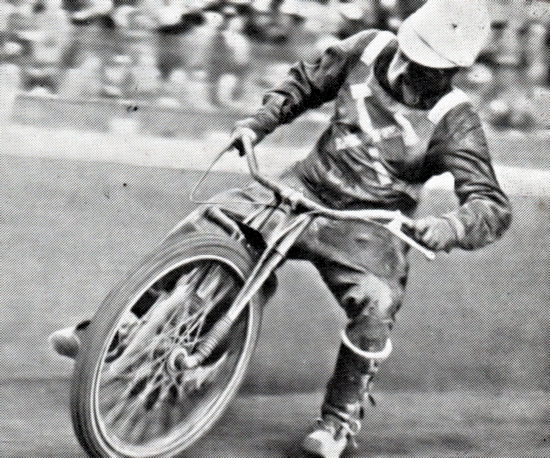 This is Ronnie Genz an Oxford rider when this picture was taken. Incredible now having a motorbike sticking out of a boot. But in the 1960s many riders travelled this way. The boot would be tied down to stop the wind catching it and the police were happy with it! All you needed was a biggish family saloon with a good sized boot like this Mark 1 Ford Cortina. Another good car for a speedway rider was the Citroen Safari you could get a bike right inside and shut the tailgate. 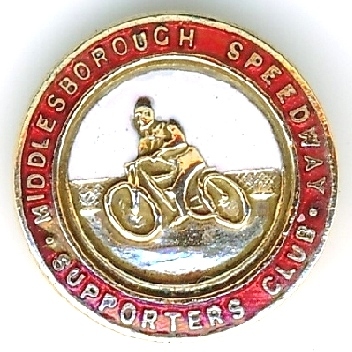 I remember New Zealander Graeme Stapleton using one when he rode for my team Newcastle in the 1970s. on in its place. A bike would sit securely on the bike rack as shown above. 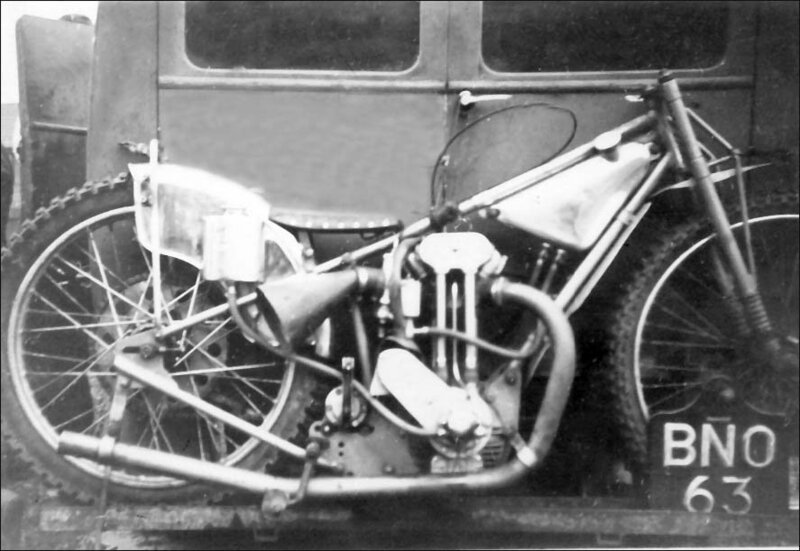 For many years speedway bikes were transported either sticking out of the boot of large cars or like this one slung on a special rack mounted on a tow bar. This rig belonged to Cliff Watson. I borrowed a bike rack in 2005 from local Newcastle rider Craig Connon when he lent me his bike to put on show at a local motorbike carnival. Danish Rider Ernst Bøgh has sent this pic of a Retro Rotrax JAP mounted on a bike rack. Although the picture is recent, this kind of bike rack has been around for decades. The rack fits onto a tow bar mounting and the bike is lifted on and secured by aerolastics and a number plate/lights board. Do it right and you can cruise at top speed, well 70mph in the UK! 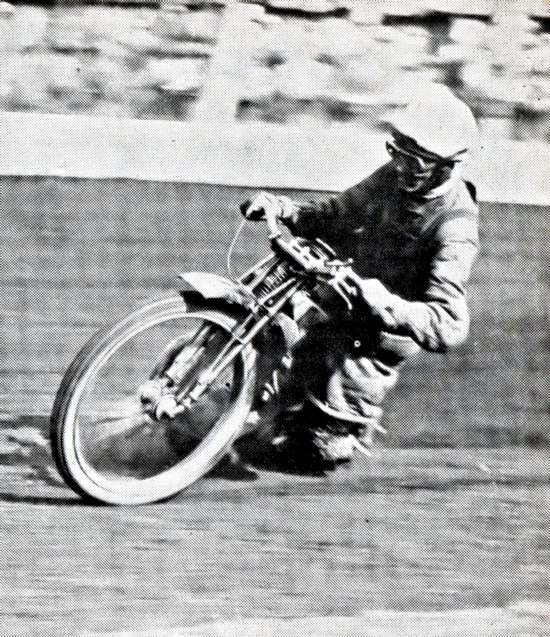 Norwich's Australian star Bob Leverenz, whose bike appears to be almost in an overslide. Or maybe it is just the camera angle. 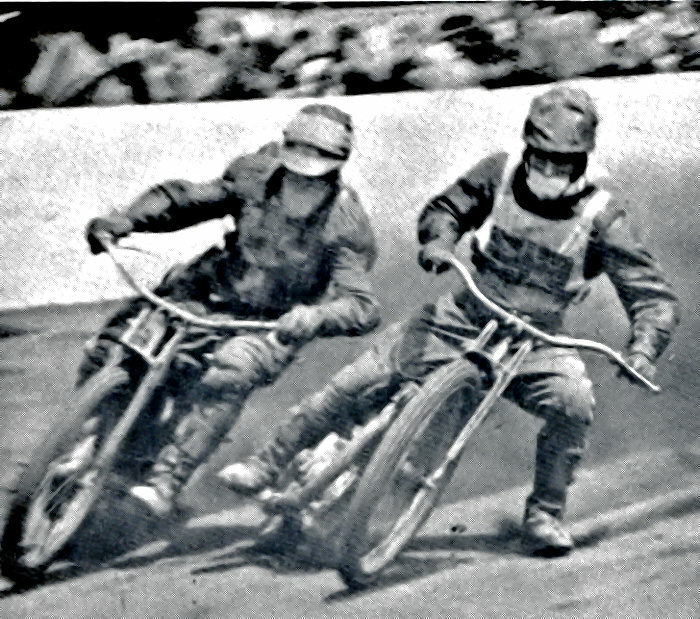 Top: Harrigay's Jimmy Squibb Middle: Bob Oakley came to grief to avoid the already fallen Freddie Williams. 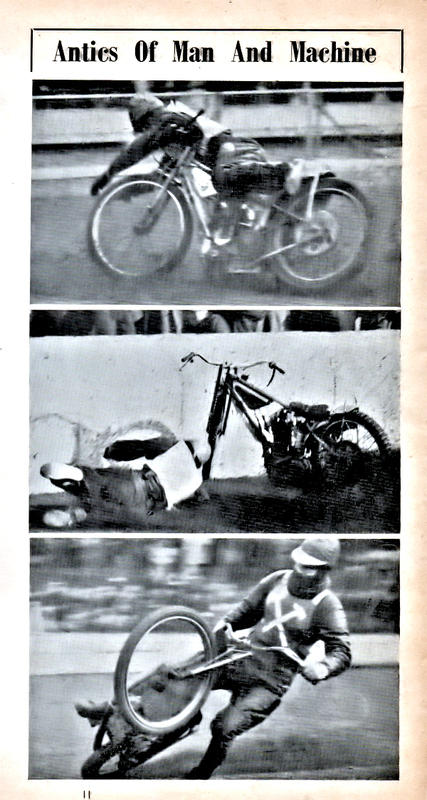 The Bottom pic: is Mr Speedway Reg Fearman about to test the padding his leathers have in the sitting down area. 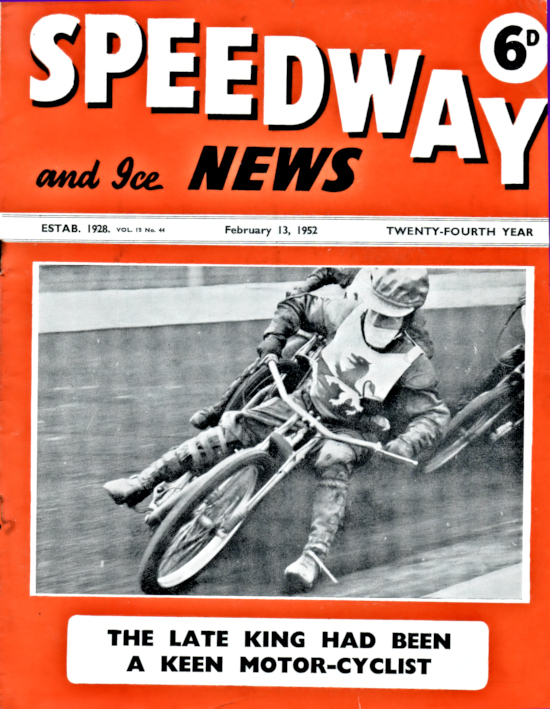 The picture appeared in the Speedway and Ice News as a "name the riders" feature. 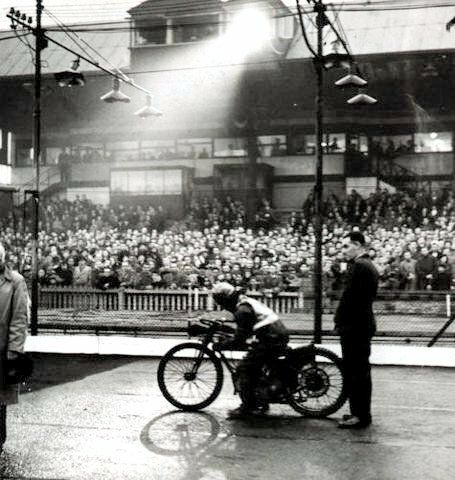 I believe it would have been taken around 1932, so go on then name the riders! John The mag is only 65 years old so perhaps they will still send you a prize! 1933 Syd was very photogenic never acheived very much and called it a day 2 years after this photo was taken. 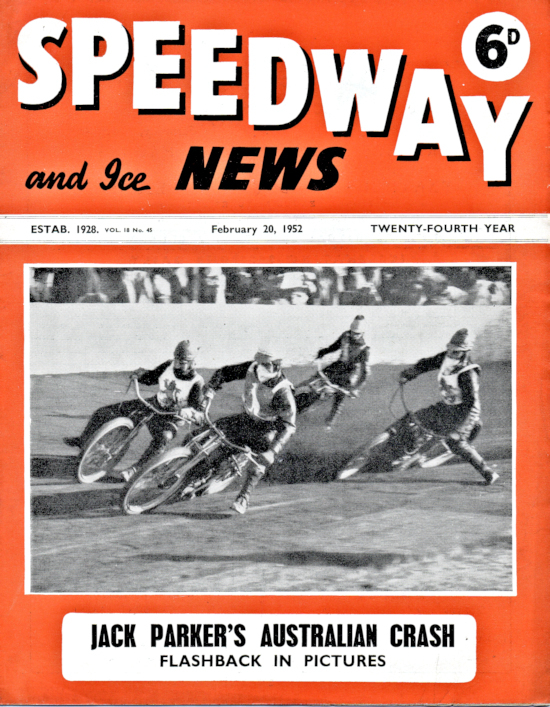 Ipswich riders feature on the front cover of this issue. 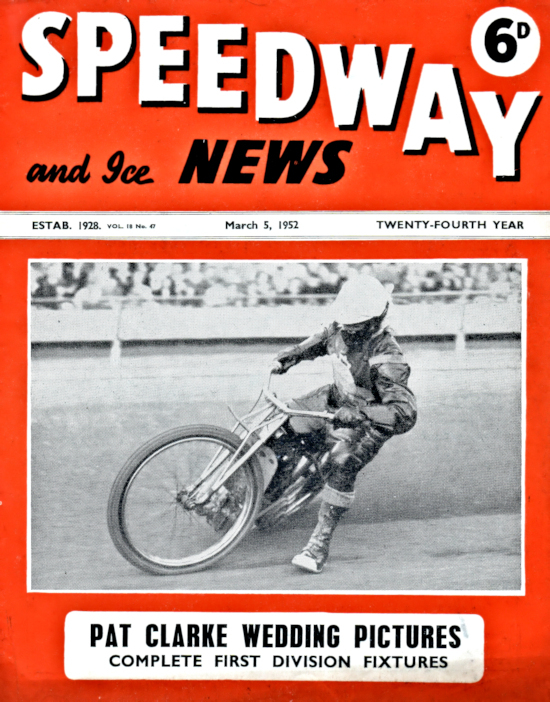 Charlie Mugford, Tich Read and Sid Clark. 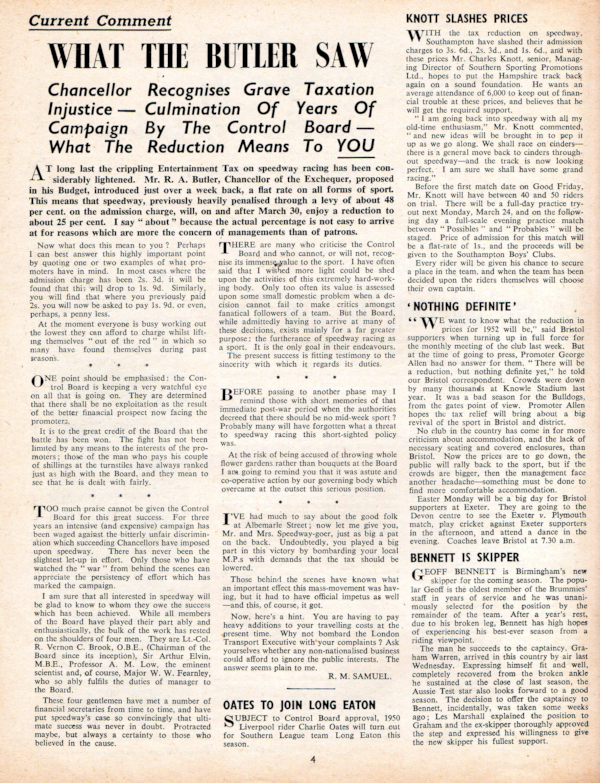 A 1930s challenge like the above would now be prohibited in the UK and any insurance cover would be extremely expensive. 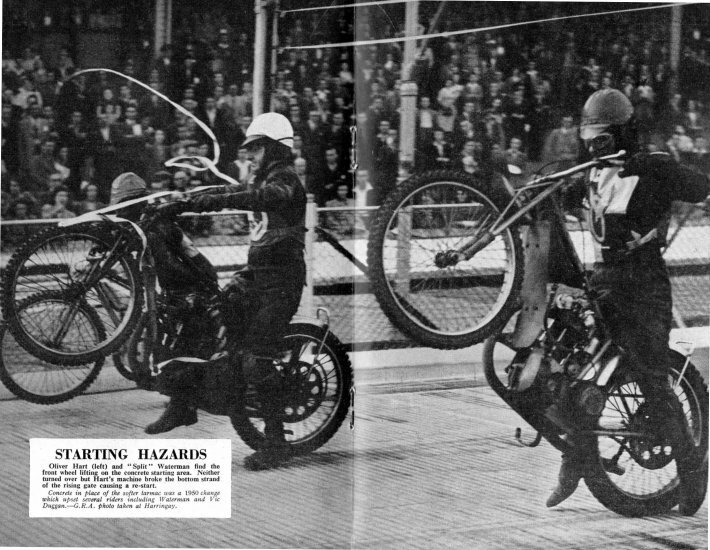 However a good few speedway riders moonlighted as wall riders to earn a few more quid! 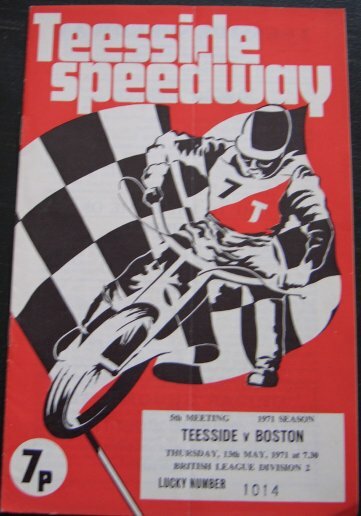 There is a decent sized section about speedway riders on the wall on this website. Go to Miscellaneous page 5 if you are interested. 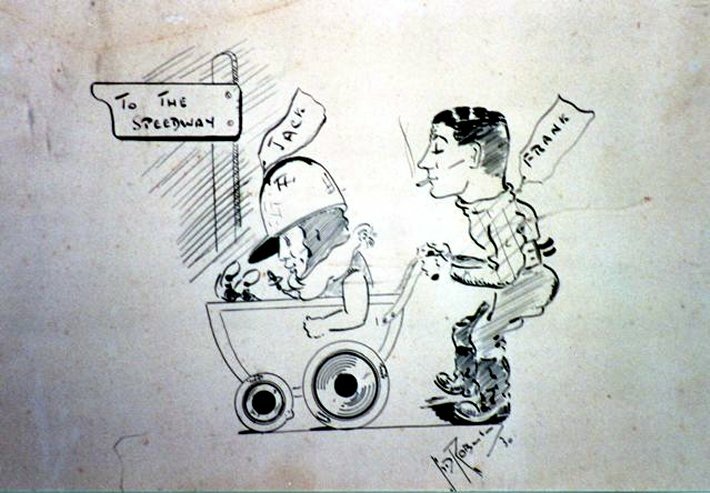 John Hyam says: This is a cartoonists view of speedway as used by the German promoters at Homburg Saar to promote their 1958 international meeting featuring Germany, Austria, Holland and England. A great work of art. I particularly like the speed blurs and how the two riders blend into one. In modern times we have Red and Blue for Home Riders with White/Green and Yellow/Yellow& Black Away Riders. This wasn't always the case. 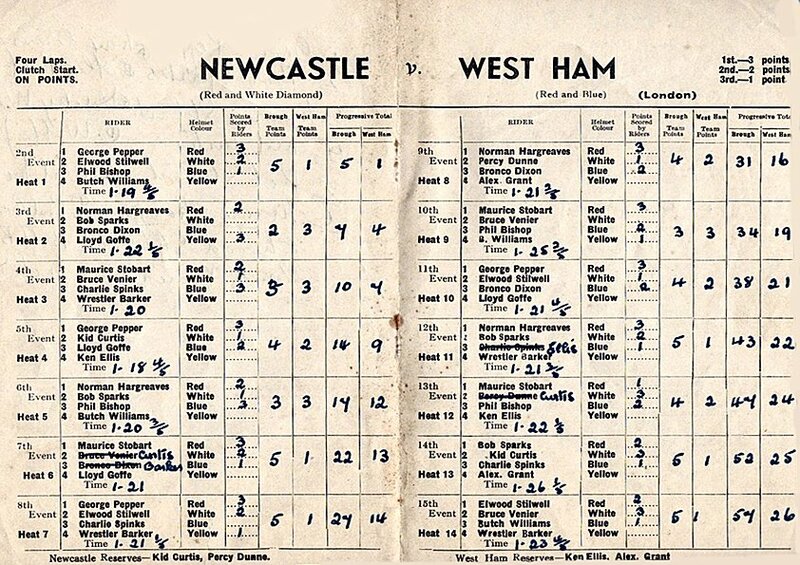 This pre war 1938 programme of a Newcastle v West Ham match. 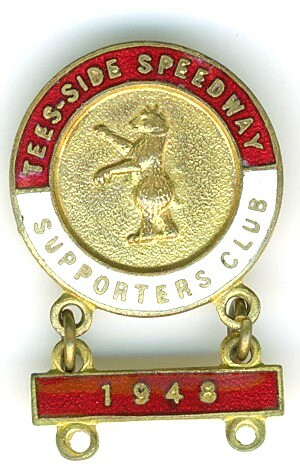 It shows the team colours Newcastle: Red and White and West Ham: Red and Blue. You may not have expected the Newcastle body colours to be shown as Red and White, as in modern times, from 1961, Newcastle have always been Black and White! 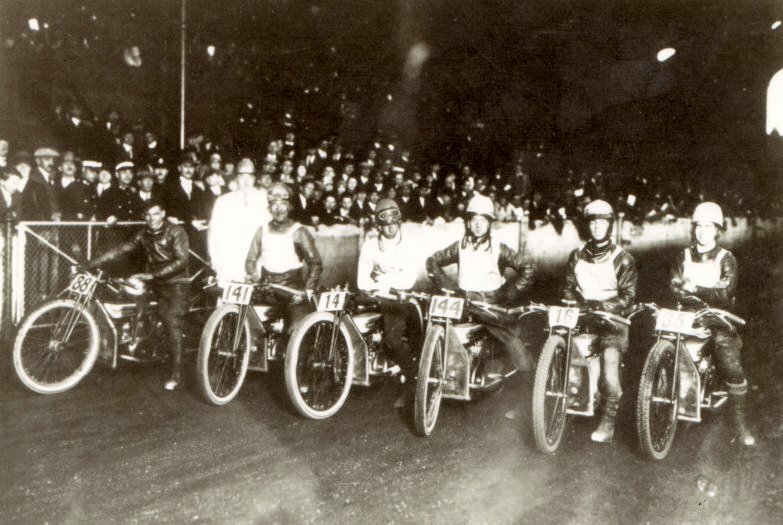 Nigel Bird says: Six riders mounted on Douglases; Venue : Stamford Bridge , This is the 1929 Birmingham Perry Barr team, rider on the left is Wally Lloyd, I would be very surprised if Jim Kempster is among these riders, I only wish I could positively identify the others. The numbers on the bikes can be a bit unreliable as a form of identification. 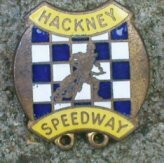 Valerie Davey would recognise this track, as her Grandfather raced here. 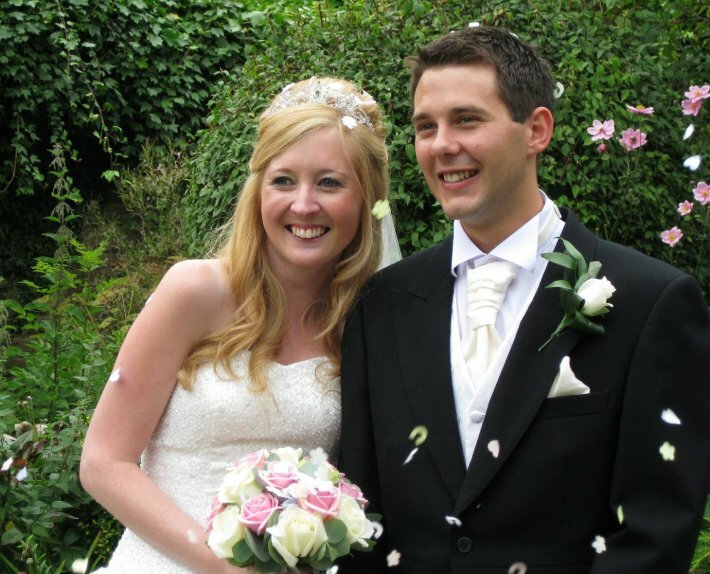 Ashley York says: This photo was with the photo of the Norwich rider (shown above). 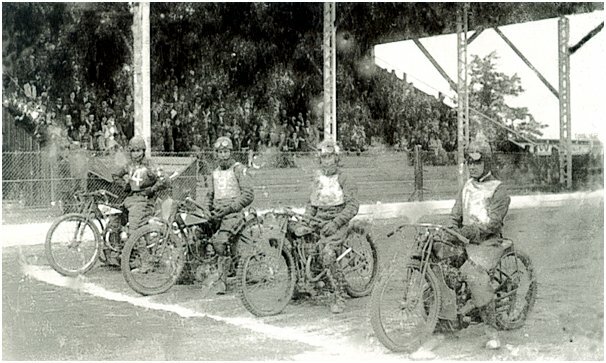 The team photo looks like it may be of a touring Australian Test team – perhaps they raced at Norwich. 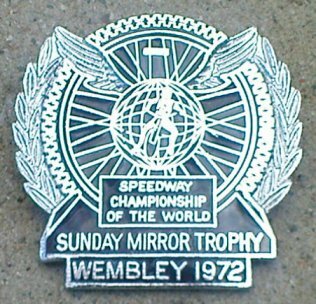 This is all pure speculation on my part based on what I have found on the internet – I have no knowledge of speedway myself. I would be interested though If you are in a position to provide any information about the photos, such as when they might have been taken, whether it is an Australian Test team, and who any of the individuals are. 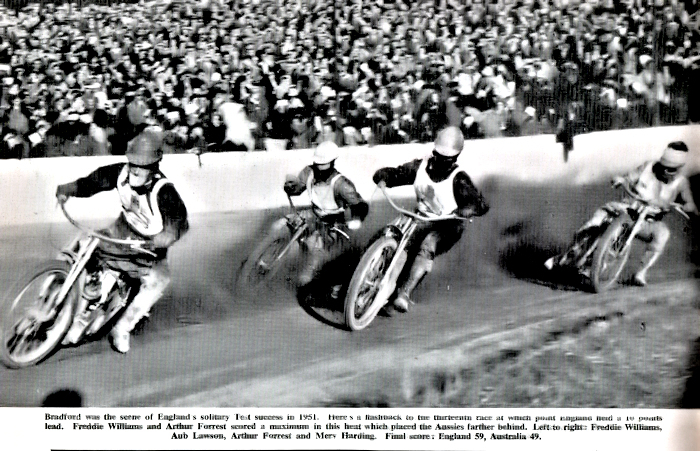 Steve Brown says: The pic of the Australian team you just posted was indeed taken at Norwich. 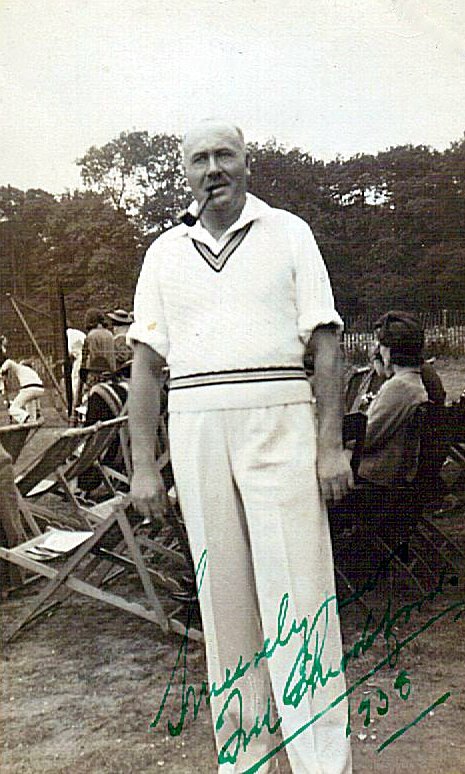 It was from the first England v Australia Test on June 20, 1953, and was won by the visitors 62-46. Back : Arthur Payne, Keith Gurtner, Jack Young, Aub Lawson. 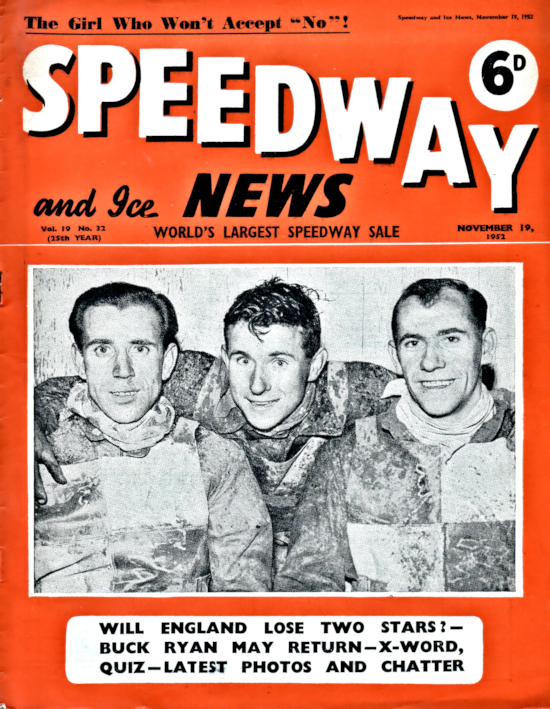 Front : John Chamberlain, Ronnie Moore, Peter Moore, Jack Biggs. 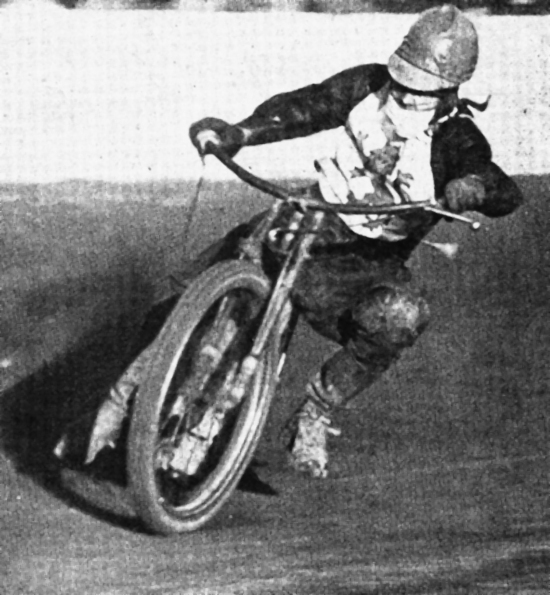 Ronnie Moore scored an 18-point maximum. 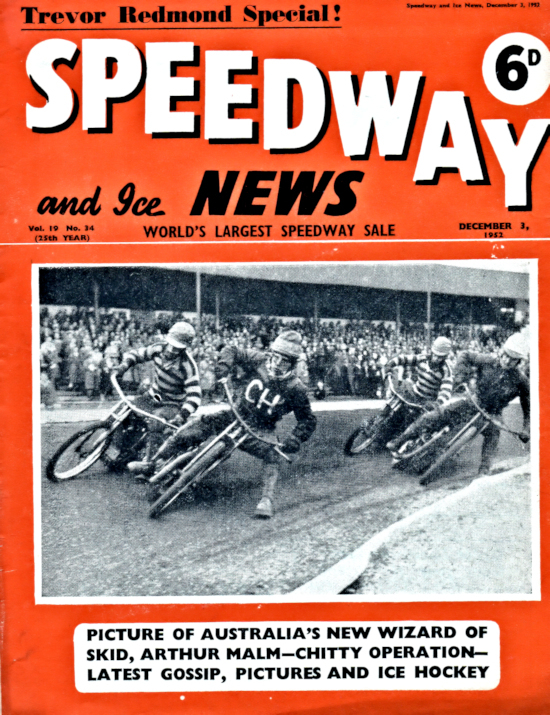 Don Price says: Just spotted the Australian team photo in your " name the rider" section so I'll have a stab at this. 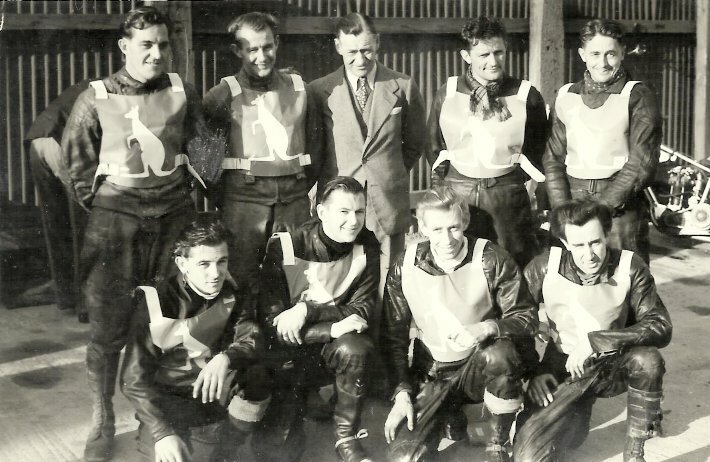 I think the riders are... (back row) Arthur Payne, Keith Gurtner, Jack Young, Aub Lawson.. (front row) John Chamberlain, Ronnie Moore, Peter Moore & Jack Biggs,. 1st Test @ Norwich 20th of June 1953. Australia won 62-46. All the best, Don. This photo of Walthamstow shows a concrete starting grid. God knows what was going on here! But the rider couldn't have been digging the dirt with his boots as it was solid concrete! This is 1940s Cleveland Park Middlesbrough. A Tarmac starting grid and their rider Frank Hodgson appears to be restricted to a rather narrow grid 1? So what could be better? A consistent start area without advantage. I wonder why it didn't catch on and now we have starts on the dirt with multiple winners from one starting position and none from another. Is it time to get the boys from the black stuff in to tarmac our starts again? Fred Pallett says: Hello John, I am not too young to remember this! I remember that all the London tracks had a hard starting area of some kind. I always assumed them to be concrete, but some could have been tarmacadam/asphalt. I clearly recall that, at Wembley Stadium, the driver of the tractor that towed the grader between heats used to raise the grader off the ground when passing over the starting area. 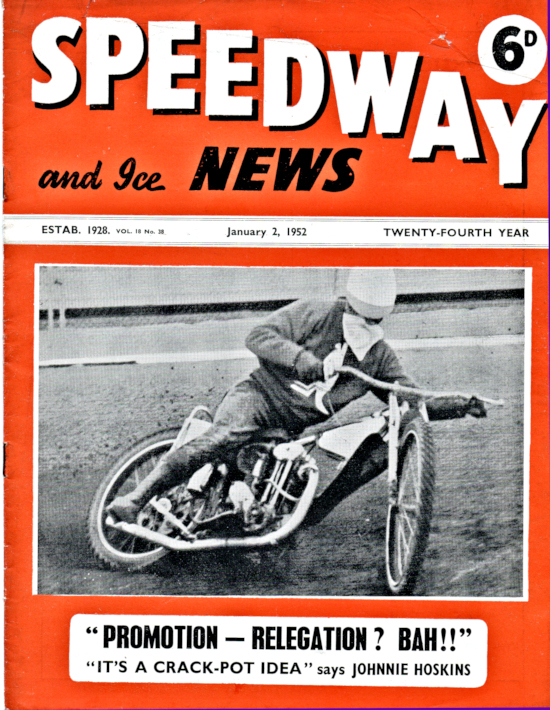 Stenner’s 1951 Speedway Annual (World Edition) includes a centre pages (48/49) photograph spread, taken at Harringay, showing Oliver Hart (Odsal) and Split Waterman (Harringay) with their front wheels lifting “on the concrete starting area” – see attached scan (above). 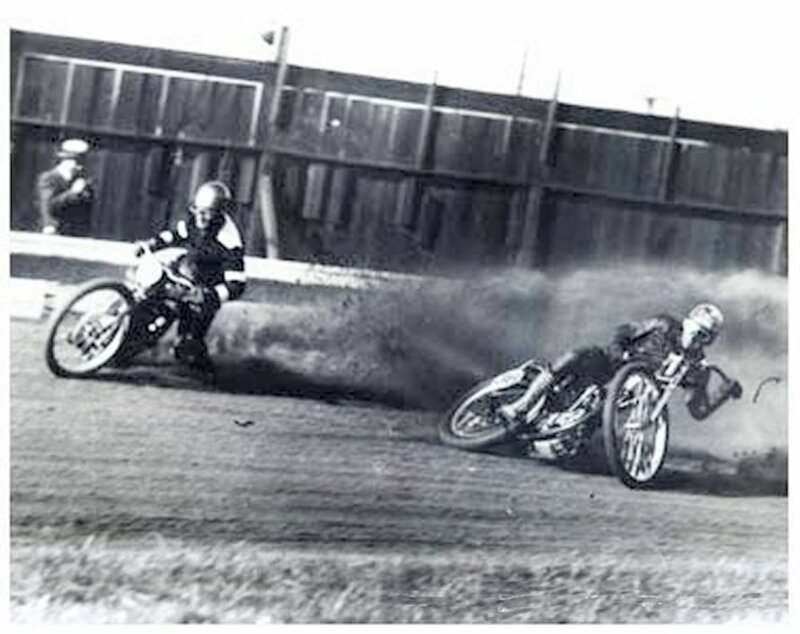 The caption goes on to state that “Concrete in place of the softer tarmac was a 1950 change which upset several riders, including Waterman and Vic Duggan”. 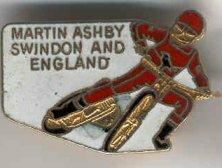 As a Wembley supporter, my speedway attendances ceased in June 1954, so I am unable to confirm the situation in later years. 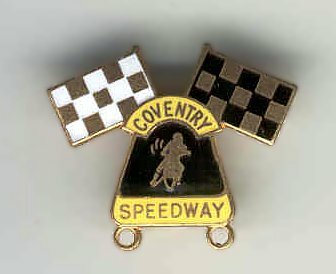 Many cycle speedway tracks also had hard starting areas, as they were generally modelled on motorcycle speedway tracks. 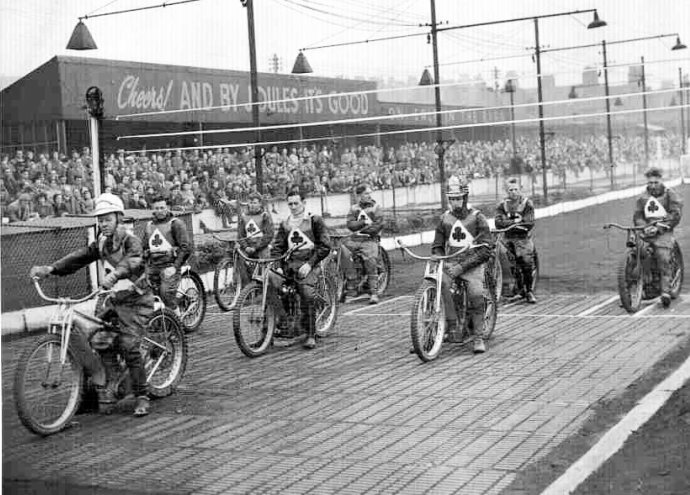 John says: 8 Belle Vue riders on the concrete at Stoke. I suppose a trackman that could grade dirt up to a seemless join with concrete would be ok and trackmen that couldn't would have a bump as the bikes entered the concrete section. Not good eh? I saw them up until 1956. I have always advocated a return to either them or the technique used when they were in use. Riders would come up to the two yard line (about the length of a bike back from the tapes) where they would be stopped by the starting marshall. When the Steward (referee) put the green light on the riders were allowed to move up to the tapes. they were then 'Under Starters orders'. They remained still until the tapes went up. As I recall there was no tape pushing and there was certainly no point in 'gardening' at the gate. 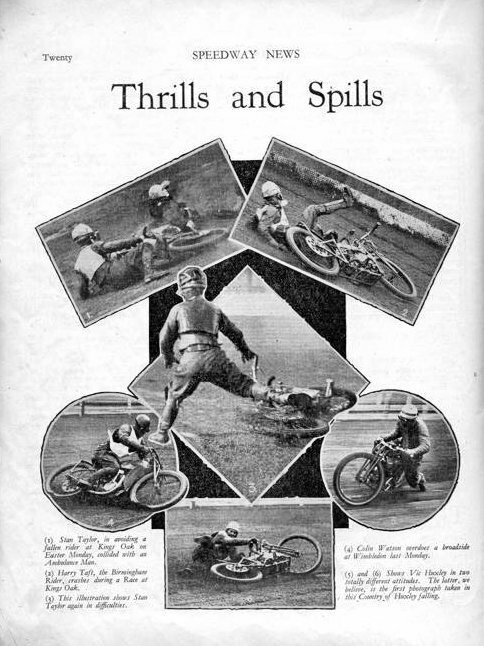 However, if a rider miscalculated and looped, it hurt to fall on the hard surface. Few did. 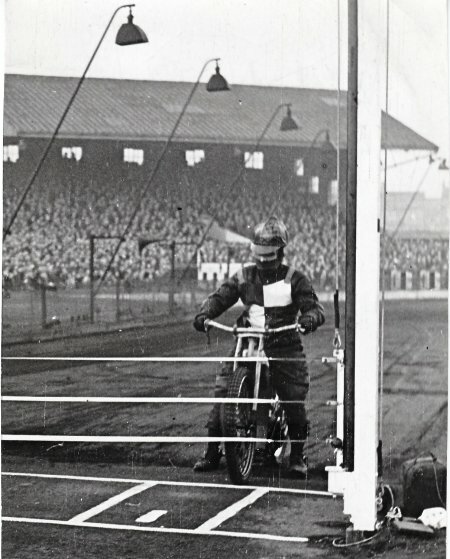 John says: Ron Johnson on concrete at New Cross in 1946 curiously it shows the concrete extending well before the starting gate, why was that? and as the track appears to be wet I wonder that if the concrete wasn't laid properly that puddles would appear on wet nights? 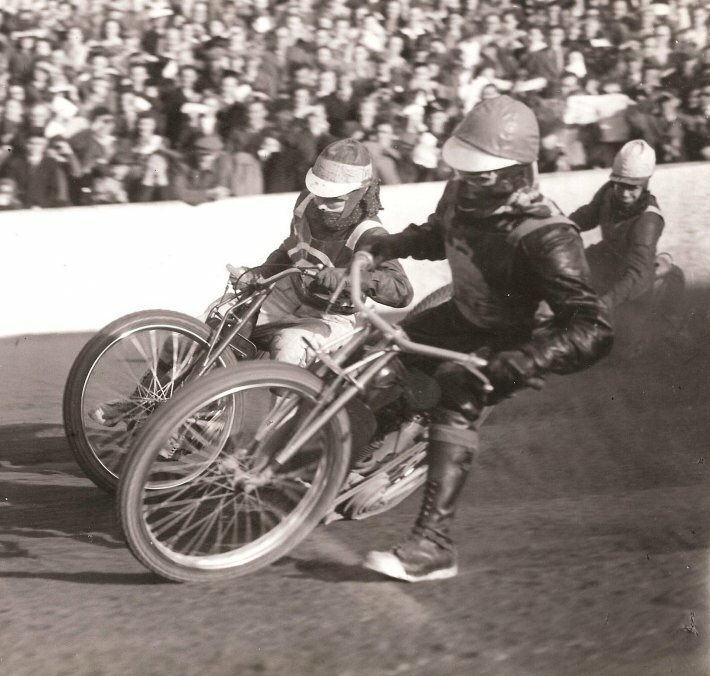 Bob Andrews sent the above photo, he says: Here is a photo of Gil Goldfinch and myself taken in 1954 at Eastbourne. I had just won the Silver Helmet Championship there. He was giving me “a man hug” in the pits, my ex. Army van is behind us. An Austin. 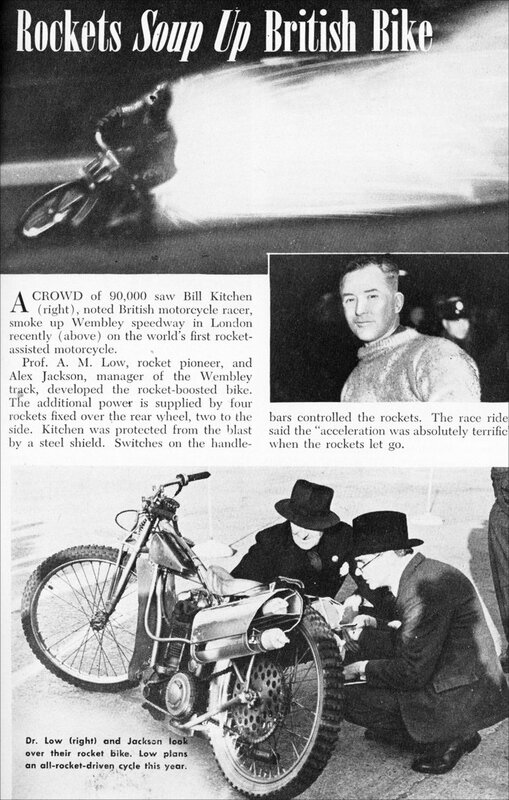 As a biker as well as a speedway fan I am interested in the makes of bikes used on Dirt Tracks prior to racing commencing in 1928 in the UK. 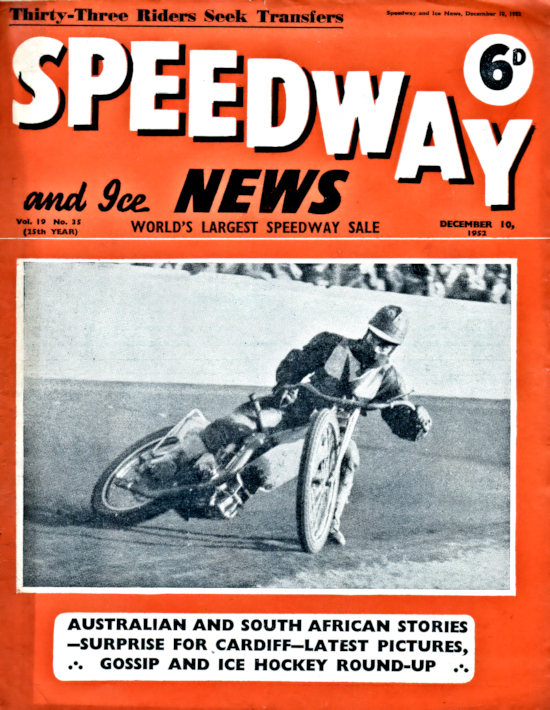 I asked Aussie Tony Webb for info on bikes in use when Dirt Track racing was Australia's private property. 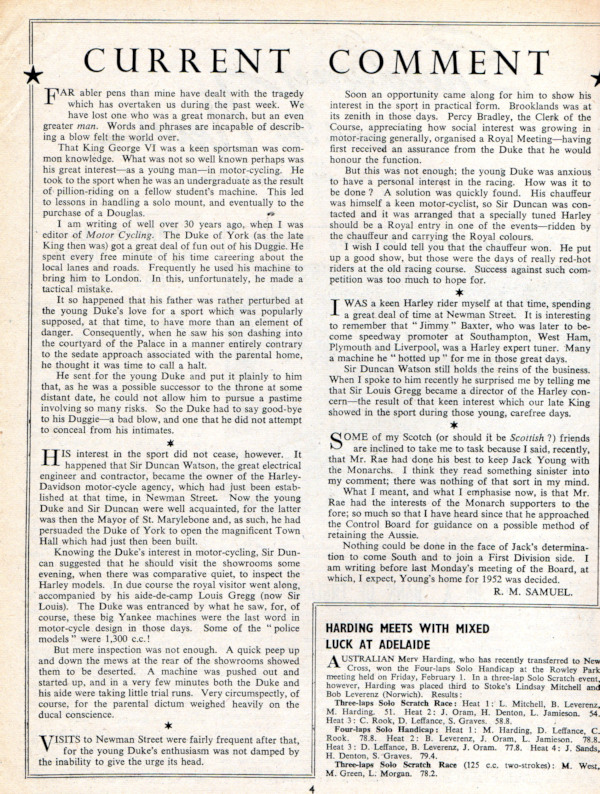 Tony sent me a scan from a 1926 Sydney, Australia programme. 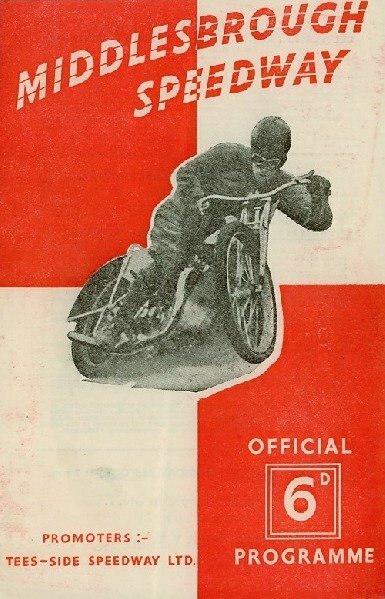 The 1926 Australian programme shows the bikes each rider was using. Glancing through the list of machines the vast majority of bikes were British with a couple of American machines Harley-Davidson and Indian added in! Douglas and Rudge are listed too. 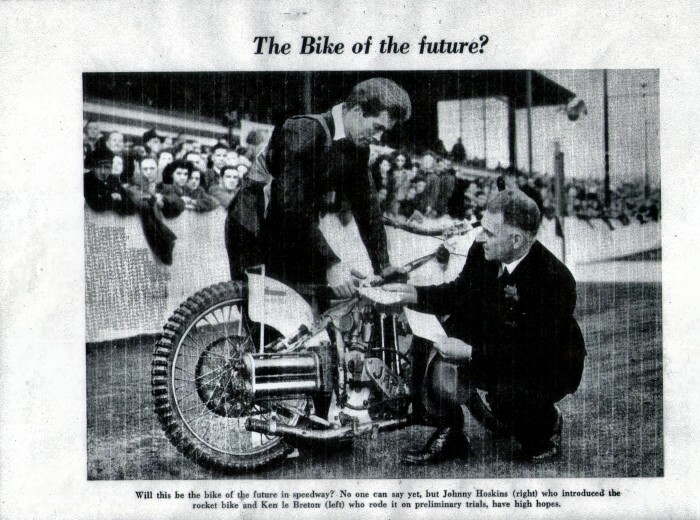 The two British bikes went on to dominate a couple of years later. I notice two machines Ogden Triumph and Ogden Norton. I presume Ogden added some improvements to the standard Triumph and Norton. I also note James and Royal Enfield. 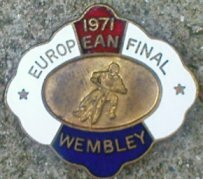 Which were makes I enjoyed owning in the 1960s. My James and Royal Enfield bikes were road going machines though. 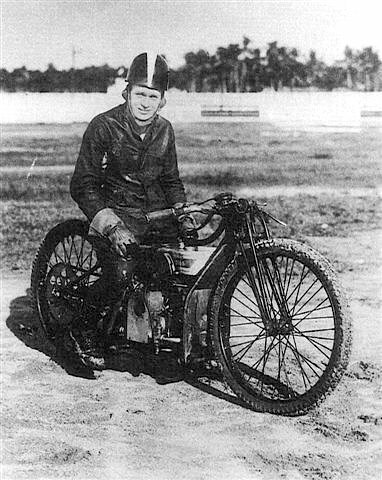 My understanding of the top1920s dirt track machines was that Harley Davidson was the first winning machine, with AJS also having some success. Followed by the very successful Douglas and the Rudge, then in 1931 the British made JAP came along and swept all the earlier opposition away. Very sad news from Tara, Queensland, Bob "Cowboy" Sharp, former Australian Champion has died following a heart attack at on September 12 2012. 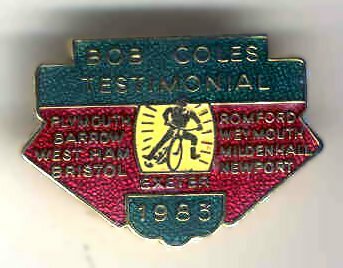 Bob is well remembered in Great Britain for his time at White City Glasgow and Ipswich 1952-1958. According to Bob’s son, Ron Sharp, his dad had visited the local hospital regarding a knee replacement. He suffered a heart attack at a friend’s house later. 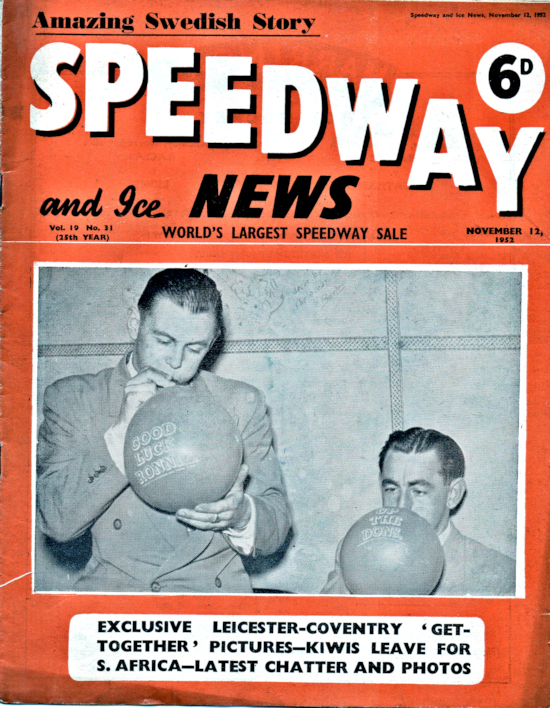 A great picture from Speedway Researcher Jim Henry. 16-W. Phillips, 17-C. S. Gill. 18-Johnnie Glass, 19-Jack Eldon. 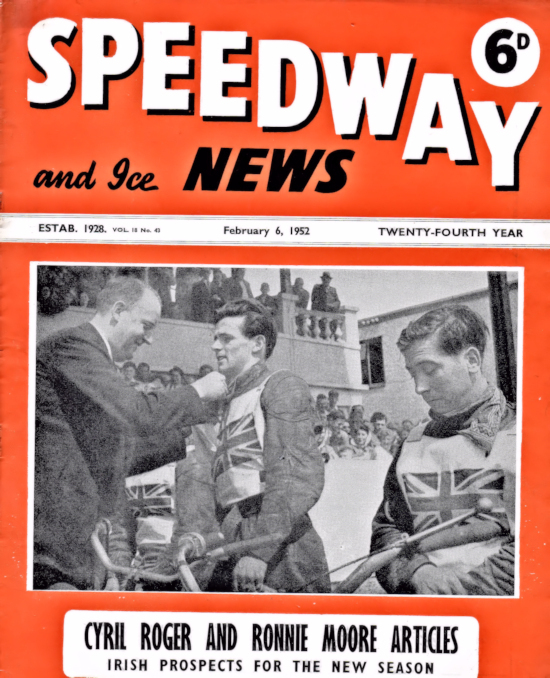 It was reported in the press that Fred Wilkinson won five out of his seven races, but the filled in programme gives him four wins and three seconds. 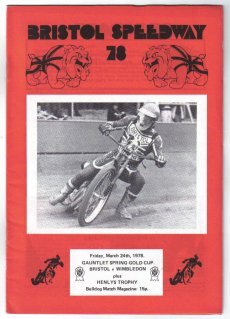 Without doubt Fred was the top rider in this meeting and from the programme he would have won £8.10.0 (£8.50) in prize money. 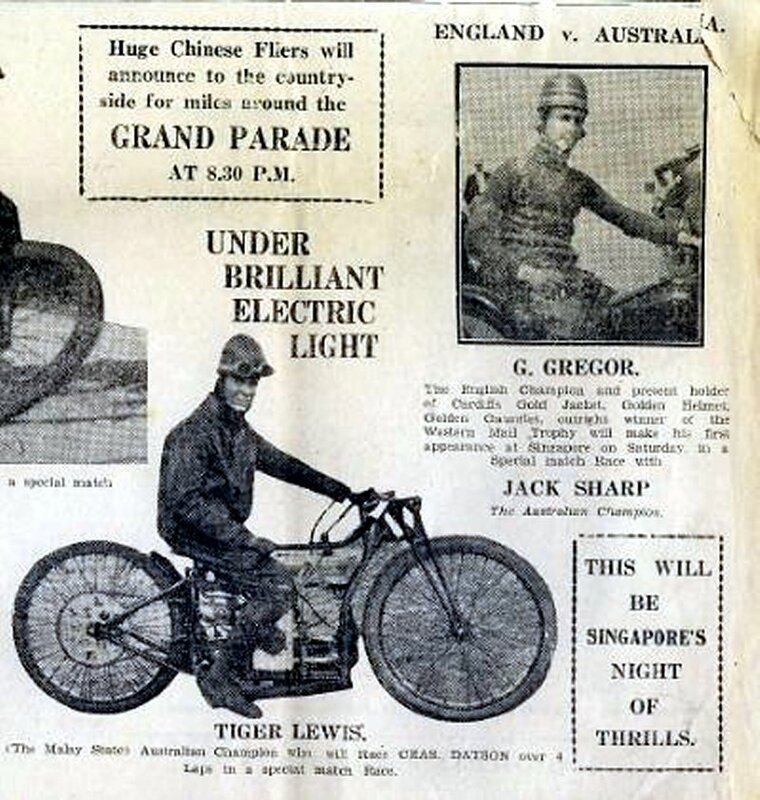 This was not a bad payday as in the programme a Hercules bicycle was advertised at £3.19.0. A Two Seater Morris Minor Car at £100 and a 250c.c. 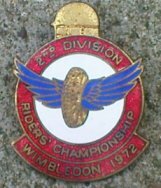 Rudge Motor bike cost £38. The admission was 7d & 1/-. As there were 20 1/- to a £, it would equal to 170 fans paying 1/- for Fred’s winnings that day. A truly great example of a 1929/1930 'ish photo which would have been black and white, hand tinted with colour. 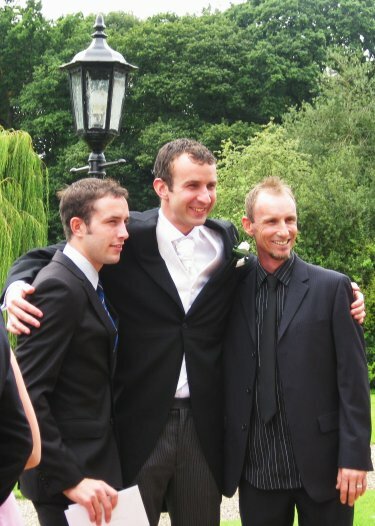 The photo was sent to me by Mike Darby who is the nephew of the two brothers shown above. 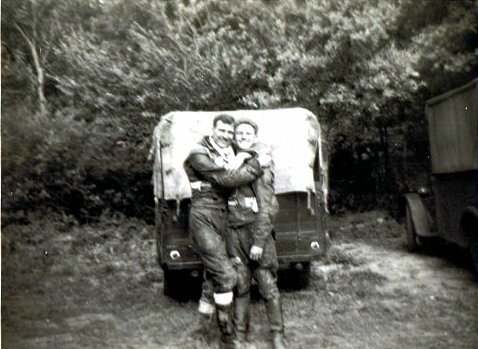 They are John and Frank Chiswell from Loughton Essex. The bike is a Douglas which had its day around that time. 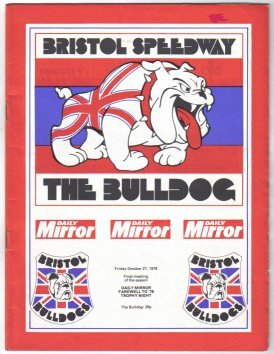 Mike Darby says: Dear John, My late Uncle John Chiswell was an early dirt track rider and with his brother Frank rode at High Beech, as they came from Loughton Essex where the family ran a garage, and I believe Belle Vue, Manchester. 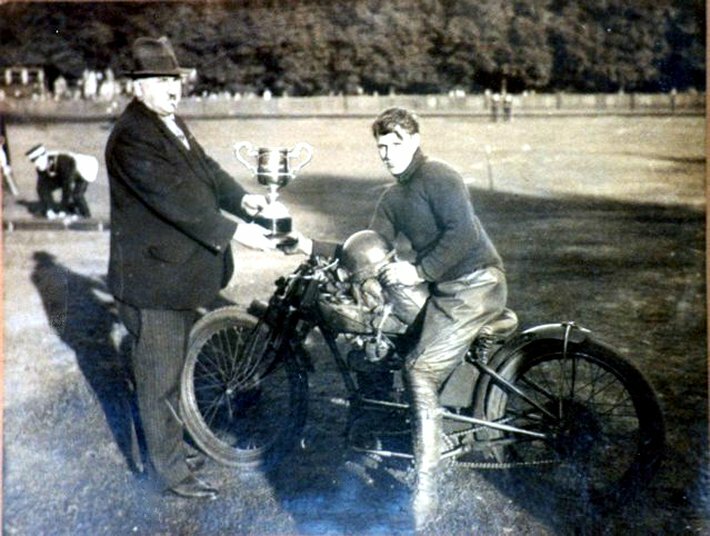 My uncle was born 1908 and married my fathers sister Constance Darby, who was pioneer ladies biker in her day. 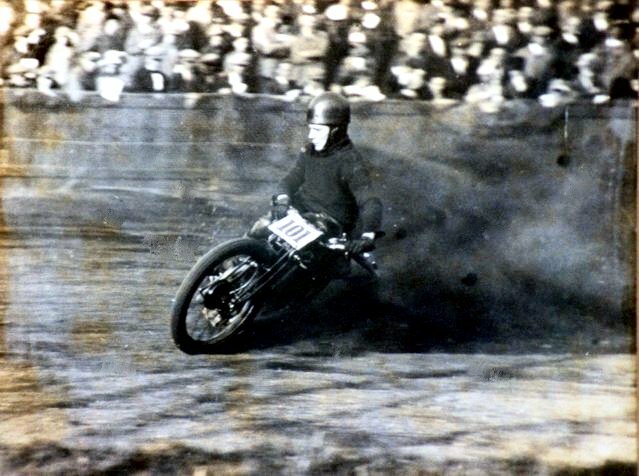 Uncle John died in 2001 aged 93 and although he showed me these photographs he never really told the full story of their dirt track days. The cartoon was I believe published in a magazine of the time, 1920/30’s, but I know very little else. 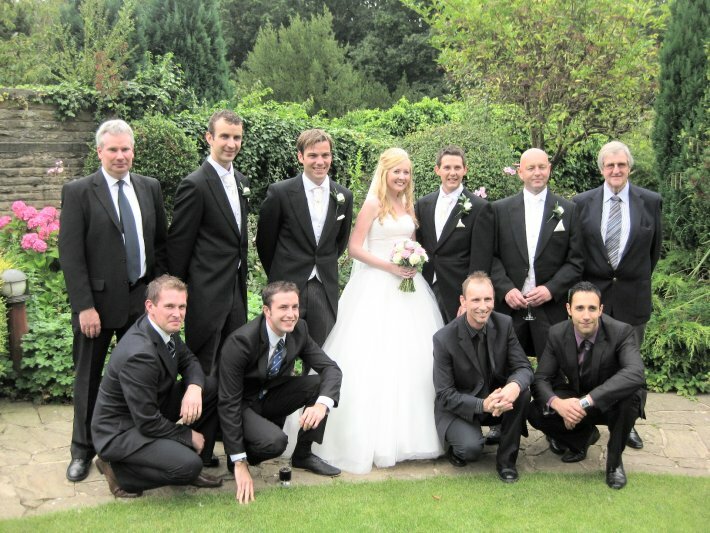 Have you heard of the Chiswell Brothers? Not sure which of the brothers this one is. The bike is a bit strange to me so if you can identify it send me and email John The strengthening strut along the frame may be a clue. John may have used the name Jack as in this sketch. Mike and I would love to hear from anyone whom can supply any info on the Chiswell brothers. Igor Sokolovskiy says: Hi John, I hope that you may be interested. Best regards, Igor Sokolovskiy. Ukraine, Rovno. Hi, my name is Igor Sokolovskiy. I live in Ukraine, Rovno. on speedway. 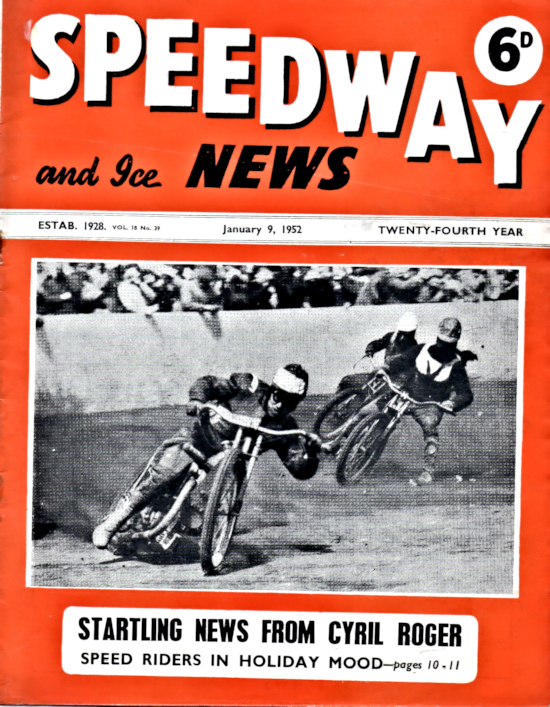 It is Rovno in his debut in speedway Viktor Trofimov, and it happened April 30, 1960. 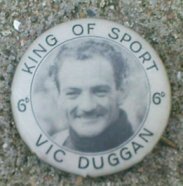 He appeared in 1962 in the USSR national team 15 times in a row started in the Individual World Championships. 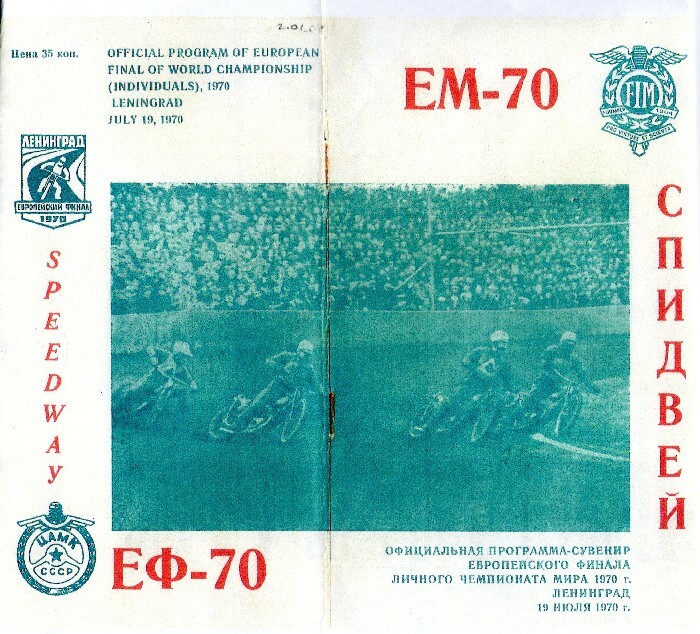 I do statistics Rovno speedway, and I can clarify about one race in England next. 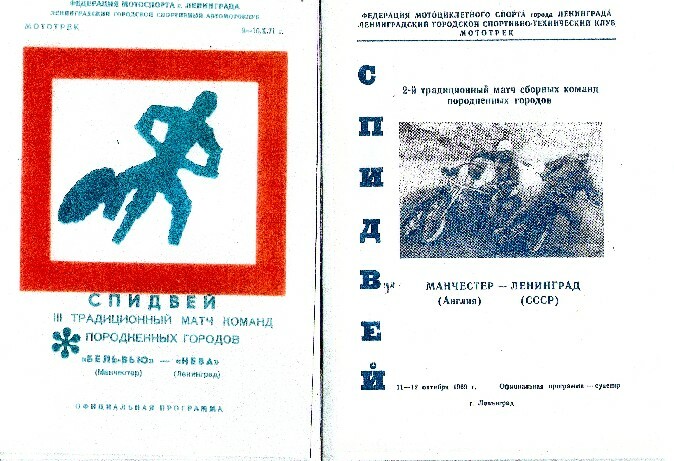 June 9, 1976 the USSR national team played its third match in England. 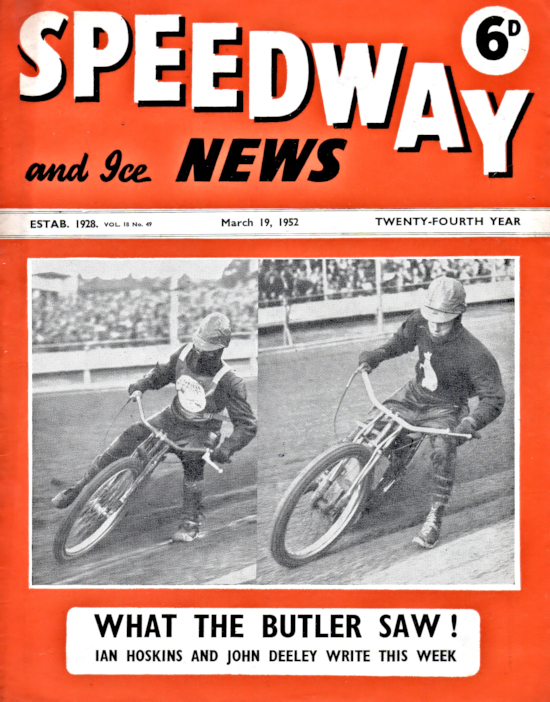 On the track at Belle Vue Aces were stronger. But the items in the guests a little incorrect. Vladimir Paznikov claimed in the race for number 8, three starts in place of Nikolai Kornev. But all the time, finished fourth. That he is pictured in the fight against Kristian Praestbro. But Viktor Kuznetsov - teammate Vladimir Paznikov in Novosibirsk Sibir', then do not got 2, and 3 points. The remaining riders are unchanged.